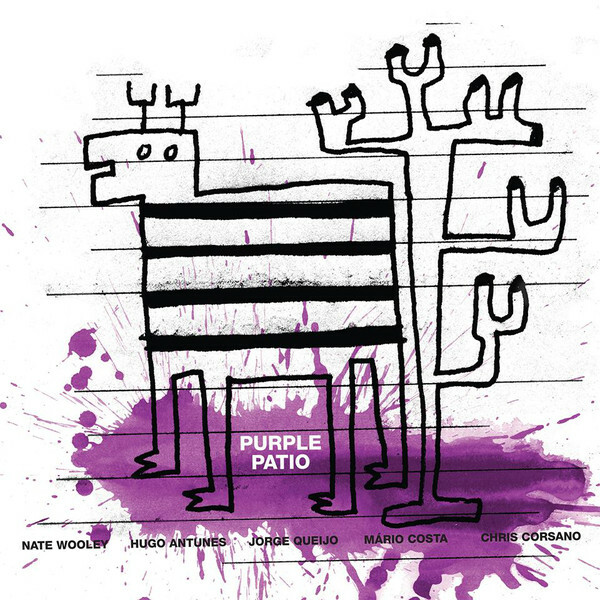 Purple Patio is a joint venture between all the musicians listed above: Nate Wooley, Hugo Antunes, Jorge Queijo, Mário Costa, and Chris Corsano. I have seen Nate Wooley perform as well as Chris Corsano. Chris came on the scene with Paul Flaherty when they did that electrifying performance on “The Hated Music,” CD by Ecstatic Yod. The other musicians are not familiar to this listener. The first track opens with, “Parturition,” a song with lots of energy. When I first saw Chris Corsano, he played with so much passion behind Paul Flaherty, I wondered if he was going to continue in this direction. Most drummers tend to take a softer approach to the drums these days. Nate Wooley matches him note for note on this intense piece. It is good to see someone keeping the flame of the first generation free jazz alive. This group does a nice job playing what some call fire music. Having three drummers tends to put in a band in that direction! The three drummers complement each other as they make percussive sounds on their respective drum kits. On track two, “Aurora,” Nate’s muted sounds set up the musical template. This method of improvising is becoming the main focal point for trumpet players in free jazz today. Hugo creates tension on his bass while Nate continues making varying trumpet sound effects. Then the drummers enter one by one, while remaining low in the mix. When you have three drummers, the sound can be quite loud. For recording purposes, I think the drums were kept low so as not to drown everyone out. The drone Nate is doing on his trumpet has a unifying effect. The result is that it brings all of the drummers together, making them play harder! Hugo picks up on this vibe after the 6:10 mark or so. He comes to the forefront with his bowing technique once Nate stops playing around the 6:33 mark. Hugo’s use of this mutated bowing is captivating while the drummers use different parts of their drum kit to support this mood change. Nate returns to glistening cymbals, while he soars upward briefly, bringing this piece to a close. “Animals” immediately begins with soft cymbals backed by bells and other percussive instruments. One drummer uses brushes as Hugo and Nate make their respective entry into what feels like a quiet place, such as a park. Nate is very melodic here while one drummer is playing temple blocks. Temple blocks have a very distinctive timbre. Hugo’s solo starts at the 3:57 mark with the drummers echoing his efforts with varying percussive beats and drum rifts. Nate takes a break but returns shortly. He can be heard in the background wailing lightly on his trumpet. The way he’s wailing is almost akin to someone making electronic music, using a knob to alter the pitch. You might not know it’s a human being making the sound. The rhythms I’m hearing seem like shadows of drummer Milford Graves. Drum rolls introduce track four, “Triangle.” The tom rolls are faint while Hugo makes sounds on his bass. This seems to be an ostinato section for the first two minutes or so before the drummer adds an extra rhythm to the rolls. He is joined by the other two drummers as percussion becomes front and center. The drumming takes on a South Asian quality. This is followed by rapid one hand sticking from all three drummers. It creates an interesting sound in and of itself. Gradually this changes to an Afro Cuban rhythm at the 3:37 mark. Most listeners will recognize the rhythm as it is prominently used in Latin music. The other two drummers compliment this rhythm in a supportive way while not playing the same exact rhythmic pattern. It changes back to the one hand sticking while one drummer is doing rolls. Open rolls take the center stage, changing again to one hand sticking. It switches again between the two rhythms. While the drums are the center of attention on this track, this piece is very restrained. That is something most would not expect from a group having this many drummers. The last track, “Sueca,” is a return to the form of what the band has been exploring throughout the tracks on this CD. The bass opens the song with elongated notes, playing boldly, but having an awareness of the open space. More sporadic percussion work is happening in the background. Nate enters around 1:25 mark. Hugo is playing parallel to what Nate is putting out on trumpet, while maintaining the flow of what he established when he began at the beginning of this song. Some of what the drummers are doing reminds me of a recent performance I saw of drummer Tyshawn Sorey with pianist Anthony Coleman at the Stone. Nate gives his trumpet a raspy quality that forces the group to continue this enigmatic flow. The band follows this trend for the remainder of the piece. Hugo continues to define this song by his penetrating bass lines. They cut through the minor mayhem with ease while Nate returns to the raspy quality which now guides the group. Everyone is following his lead. At 5:59, Hugo plays an interesting figure on his bass. Nate jumps on this figure, alters it and takes this melodic line to an entirely different level. This is the best I have heard Nate play. It is infectious as all the members join the fray and begin to break away from the form. This section is very free as the drummers share the space and play with a sense of urgency! This record has the energy audiences expect to see a band bring when they attend live music performances and the band’s groove is one that can light up a crowd. I would like to see these musicians focus on this approach more as I feel it will bring them greater success and popularity. Here’s another recording for free jazz fans to enjoy. Remember, this is a very limited edition CD!